This server has received 2229265 hits from both ipv4 and ipv6. 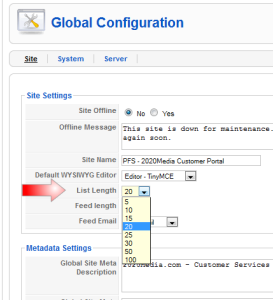 There is a default of 20 line items set in many Joomla backend administration menus – including articles, modules, plugins and the extension manager. This ‘lines per page’ can be changed but it’s not stored next time you login. Here’s how to permanently get Joomla to remember how many lines you’d like to see. 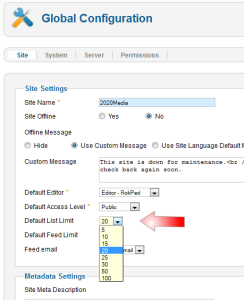 Here’s the same setting in Joomla 1.6, 1.7 and beyond. Click to enlarge.